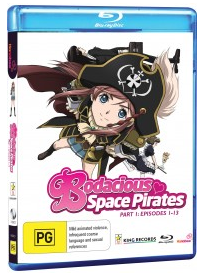 Bodacious Space Pirates is an animated science fiction adventure about ordinary school girl Marika Kato whom finds out that her long lost dad was a space pirate captain of a ship called the Bentenmaru. Sad news follows shortly as she also finds out that he had died from food poisoning just hours before Marika found out about her dad being a pirate. She is also the next in line to be the captain as she is his only child and of course she refuses (wouldn't be anime if it wasn't for this cliche you see in a bazillion other anime titles) because she would rather have good grades over piracy (how evil). 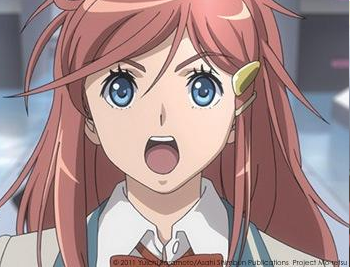 When she returns to school she is surprised as not only is her new teacher one of the pirates that want her to captain the Bentamaru (with the sweetest name ever “Kane McDougal”) but she also gets a new exchange student joining in her class (named Chiaki Kurihara) and she is also up for joining Marika in the Space Yacht Club. The Space Yacht Club is where a group of students from different classes fly spaceships in order to excel space travel so they can be astronauts. Marika also has a after school job where she works as a maid at a very beautiful vintage cafe. Marika also notices that strange people in suits start showing up at the cafe as soon as she gets the offer to be captain making her very nervous then Chiaki walks into the cafe and explains to Marika that they are all agents from the government who want to kidnap her and get any piece of info they can out of her (F**king government fascists pigs). The suits then try to take Marika but Chiaki saves her and they get the seven seas of rye right out of there. Marika then decides that she wants to be captain after-all and thus begins our journey for Captain Marika the Space Queen. (Hit "Read More" for full article or I'll make you walk the plank arrrgghhh). A word of warning, don't go in expecting this to be a all-guns blazing action series as it is far from it. The show heavily relies on strategy and suspense building much like playing RTS games (Real Time Strategy) like FTL (make sure to check out Darabka's lets play). The show has a lot of techobabble in it and you will either love it or hate it and I personally love it as it adds charm and makes it feel like I'm watching a proper sci-fi show instead of an anime series (like Star Trek). Each story arc feels more like I'm watching a movie instead of a television series. The writing is very tight and has very little to no filler in it giving it a very beefy feeling. The endings to each story arc is very well done and the build-ups do pay off greatly and does have some unexpected surprises giving me a great sense of satisfaction from watching it. Not everyday a does an average girl get to trek for space booty. The character designs look well made but nothing much stands out as we have seen these kinds of characters in many many other sci-fi anime before so it is lacking some uniqueness. 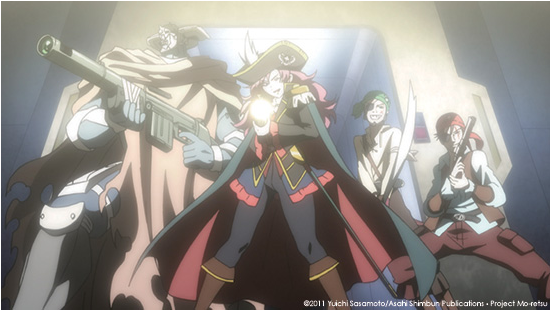 The character that does stand out the most is Marika herself as her pirate costume is very grand and re-memorable. My favorite part of the artwork is the scenery with its mixture of futuristic machinery and vintage looking buildings giving it a very beautiful look. The dub was very decent so no complaints here. The music is very good especially the intro track as it gets you right in the mood. Special features are very basic with text-less opening and closing sequences but are worth watching over and over. Overall this was a charming show that resembles more of a proper sci-fi show more than a anime although that could be debatable between the two fan-bases. Sci-Fi or not it was a very charming show to watch with some very tight storytelling. I definitely recommend checking this one out. Bodacious Space Pirates is indeed nice. Good Review man! Thanks for the shoutout! Im a big fan of the Space Pirate concept, and this might attract me to watch the show. The title seems to be more bait and doesnt reflect the show based on your review. While it does have the old Shonen style thrope of the "average" Highschool student (not really average right? Also they are always very attractive in comparision to the normal people). Still it reminds me of "Guardians of the Galaxy" altough they are more literly Pirates. Off course the other thrope is present that other people in her highschool are also involved in the space pirate buisness. Also you need the evil faschist government, thats standard for a BUNCH of Anime not only Shonen (atleast from the ones I saw, Blue Gender comes to mind). I might give this a shot, good Review, Ill read the other ones too. Good way to spend my break at work.